Taking the day of maximum volume, at 23.104k km^3 on 15/4/14, 2014 has the second lowest volume behind 2011 which had a maximum of 22.677k km^3. As the graph below shows the last three years have all had maximum volumes around the same level. As discussed previously, this may be a feature of the pack becoming predominantly first year ice with a greater proportion of ice reaching a similar thickness around 2m thick. It will take quite a few more years to see if this is indeed happening and if recent years are showing the start of a levelling of the reduction in annual peak volume. As noted in the previous post, for the decline of annual peak volume to continue into the future suggests sea ice free winters as early as the mid 2030s, a prospect that does not seem at all feasible. 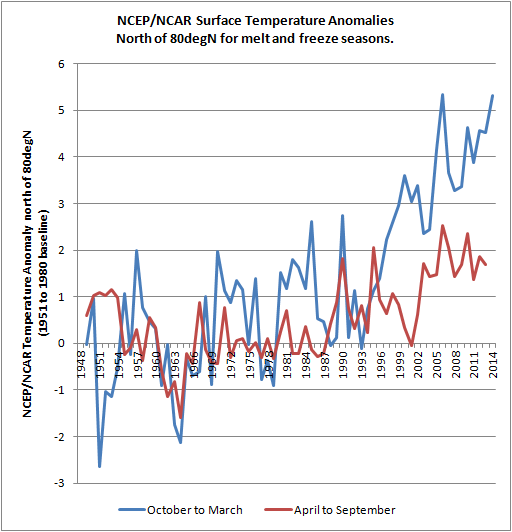 As noted elsewhere 2014 has seen the warmest January/February/March (JFM) period since 1948 for NCEP/NCAR surface temperature north of 80degN. The region north of 80degN being chosen to match the commonly used DMI temperature plots, however DMI uses ECWMF reanalysis data. 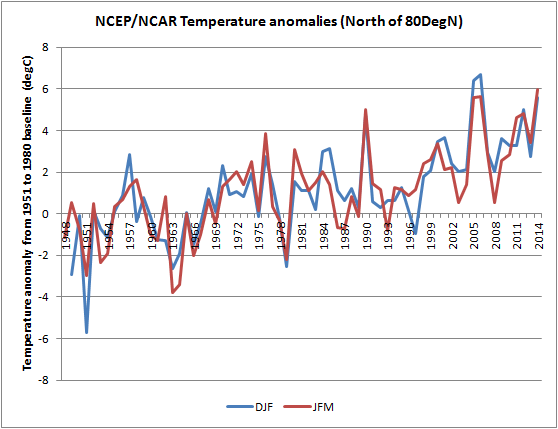 NCEP/NCAR temperature north of 80degN is shown below for both JFM and DJF, this data is shown as anomalies from the 1951 to 1980 baseline average as used by NASA GISS. Unlike 2006 this late winter warmth is probably not an anomaly and appears to be a continuation of an entrenched trend. 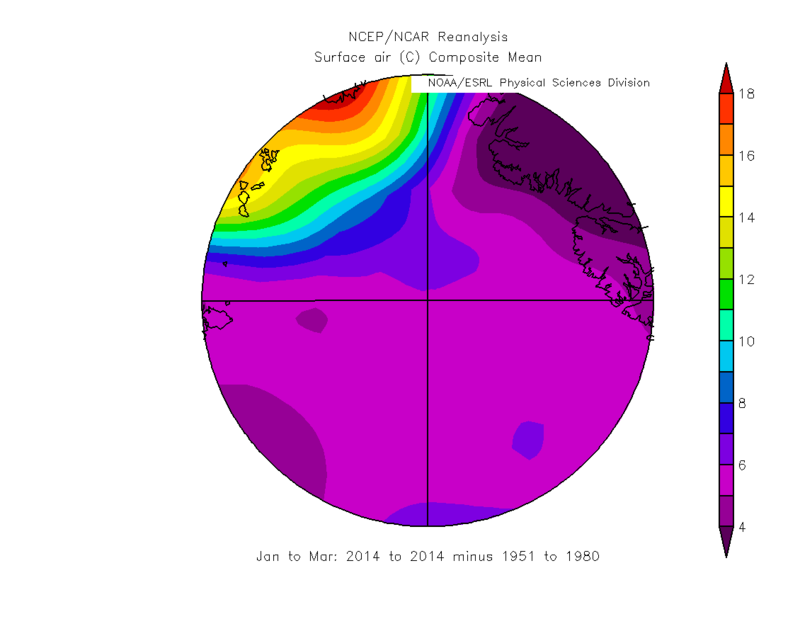 However I will argue that anomalous atmospheric heat transport seems to have played a role. The geographical distribution of the JFM warming is seen to be uniformly high over most of the Arctic Ocean. However there is a very strong warming around the Atlantic ice edge due to sea ice recession in the region (top left). This is becoming a persistent feature of recent years. It is worth pointing out that the temperature anomaly over much of the pack is of the order of +5degC! In the 1950s average JFM NCEP/NCAR temperature north of 80degN was about -34degC, the average temperature for JFM from 2005 to 2014 was -29.7degC. 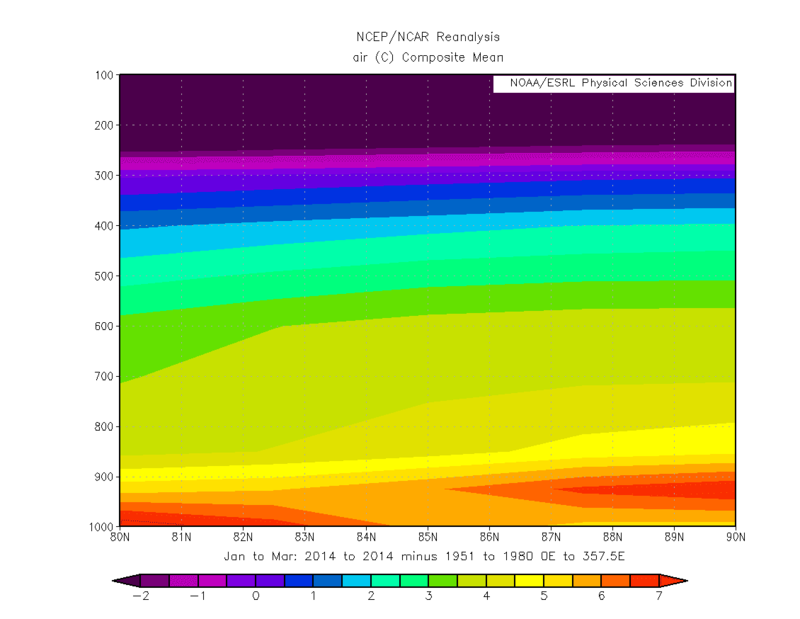 Taking a slice through the atmosphere in NCEP/NCAR it is possible to examine the vertical distribution of warming in the atmosphere. It is seen that whilst there is a substantial warming below around 900mb close to the surface, there is also substantial warming aloft up to 500mb. Graverson et al 2008 found that using ERA-40 reanalysis Arctic Amplification was being caused by warming aloft, they concluded that Arctic Amplification was due to increased heat transport into the Arctic, however this was found to be an artifact of the ERA-40 data. Screen & Simmonds 2010 found using ERA-interim reanalysis data that Arctic amplification was primarily driven by surface warming due to the loss of sea ice and snow cover. That noted, finding warming aloft is a reasonable indicator of poleward heat transport, particularly in winter where the Arctic atmosphere is dominated by infra-red emission. I think it is reasonable to conclude that the above plot shows continued low level warming due to thinning of sea ice, discussed here, while the warming between 900 and 500mb suggests this winter was anomalously warmed by heat transport over the Arctic from mid latitudes. 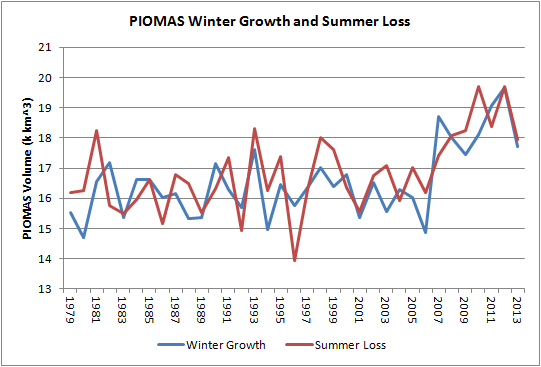 PIOMAS volume gain over the winter is shown in the following graphic. This is calculated as the difference between the daily series minimum and maximum, however the year centres on September, so melt season (summer) loss is paired in a year with the following freeze season (winter) gain in volume. This is because freeze season gain is a function of melt season losses. That the growth and losses of 2013 are near equal is not only a function of the reduced melt last year, it is also likely to be a result of the warm temperature anomalies over the Arctic Ocean this winter. However despite winter growth of ice matching summer losses winter warming is far greater than summer warming. This is largely because it is the loss of ice driving surface warming, not the warming driving loss of ice. 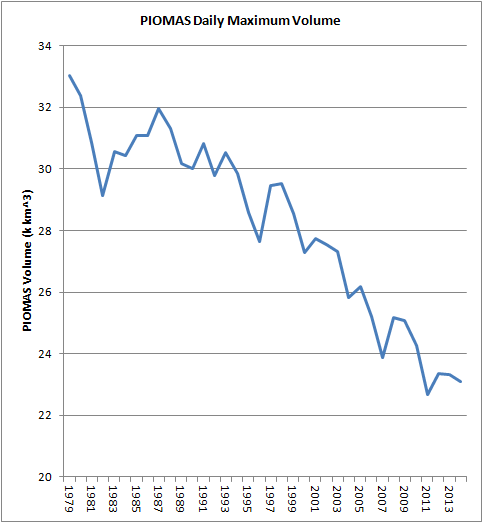 So what does maximum volume mean for a particular year's minimum? 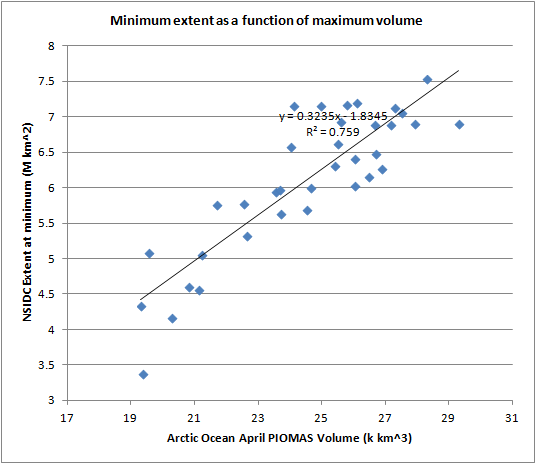 I've taken 1979 to 2013 daily minimum extent for NSIDC Extent, and PIOMAS volume for the Arctic Ocean in April, the month of maximum volume. Taking Arctic Ocean volume only marginally increases the R2 from 0.746 to 0.759, it is mainly done because if there is a role for initial volume (and its implications for thickness) then this is set by sea ice within the Arctic Ocean. Here it can be seen that there is a strong relationship between the overall decline in NSIDC minimum extent and Arctic Ocean sea ice volume in the preceding April. There are good reasons to see the decline in volume as driving the decline in extent, as the ice thins so it is easier for it to melt to open water by the end of the season. 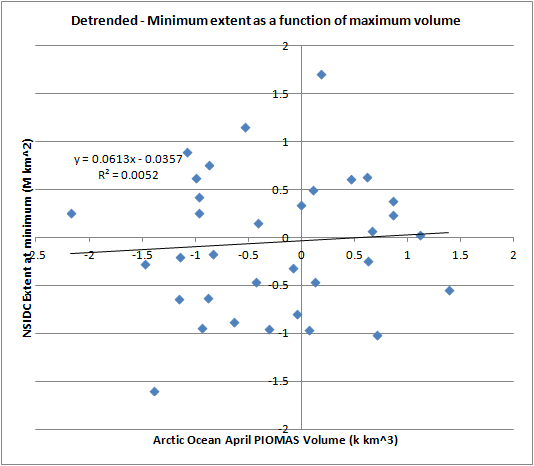 To look at the impact of April volume within the Arctic Ocean on a particular year's NSIDC Extent minimum, I've detrended by taking the interannual differences between each year of both series. In effect the following scatter plot answers the question: What is the relationship between volume changes from year to year and extent changes from year to year? The strong relationship in the previous plot has disappeared, not only is the R2 near zero, but the slope of the regression fit is negligible, you could comfortably eat your dinner off a table with that slope. There is no relationship between maximum volume changes from year to year and minimum extent changes from year to year. So with overall volume being close to recent years all we can say is that 2014 is likely to be near the trend, but the trend has a wide margin of uncertainty, so the fact that 2014 is the second lowest volume gives us little information about the coming melt season as compared to other recent melt seasons. The exception being last year, 2013 was an outcome of weather impacts, I don't expect that to be repeated in 2014. PIOMAS gridded data for April now available!! Already posted - taken me ages though.